Your can receive payments from the passengers in four ways. Some of them are available for in-app orders only and some for dispatch, webdesk or 1-click button as well. These methods are available for all types of orders. Passenger pays at the end of the ride in cash or can make a bank transfer using driver’s terminal. Your driver chooses “Paid with terminal” or “Paid with cash”. The money goes directly to the driver or to the bank account connected with the terminal outside of Onde. After the payment the system charges driver’s balance with a subscription fee (if applies). If your company enables a payment gateway, your passengers can add credit/debit cards and use them to pay for the rides. “Credit & debit cards” method allows clients to choose a card and pay for the ride directly from the app. The option “Automatically charge client’s card” allows you to get payment from the passenger’s card without his/her confirmation. If “credit & debit cards” option is the only available payment method for the service type, the client won’t be able to order it through the webdesk or dispatch panel. How do my passengers know about available payment methods? 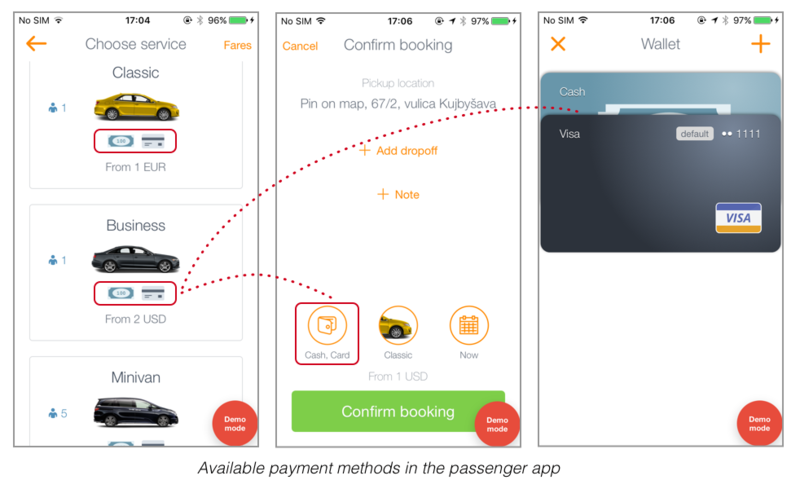 While making an order through the passenger app, the client can see possible ways of payments for each service type. They are reflected with appropriate images under the service visualization. Before confirming the order, the passenger can choose payment method he/she will use to pay for the ride as well. If your passenger does not have credit/debit card connected with the app, he/she won’t be able to order a service with only “credit & debit cards” method. System always prioritize in-app payments. For example if a passenger added a c/c and orders a service type with has cash/terminal and credit card payment methods, so at the end of the ride the system will automatically charge default card of the client. In case the payment is rejected (tips how to handle such cases are here), passenger app will ask client to choose another card or payment method. Service types which accept cash/terminal payments only are an exception from this rule.